Burglars smashed their way into an Eastbourne vets and stole charity boxes at the weekend. It is thought the intruders broke into Foreman and Hanna, in The Goffs, Old Town, by ramming the glass door with a scaffolding pole early on Saturday morning (February 3). 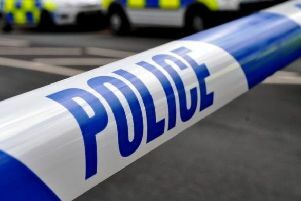 According to police, officers were called to an alarm sounding at 5.30am and found a glass panel on the front door had been smashed and two charity boxes and part of a sweets charity box had been stolen. Danielle Martin, who works as a veterinary nurse at the practise, said, “It was a bit of a nightmare. We got a phone call from police – it turns out someone had taken a scaffolding pole and shoved it through the door. “The glass panel was smashed in. We lost our charity boxes. We think there was potentially a lot of money in there. “It was distressing for my work colleagues and it was upsetting for clients but they were all very supportive. It makes it a bit worrying for us, we are working until 7pm at night. Anyone with information is asked to contact police online here or call 101, quoting serial 251 of 03/02.